Who Casts Those Oscar Votes? Like taxes and NCAA basketball, cursing at the TV over the outcome of the Academy Awards is a rite of spring. Every year, viewers find axes to grind: How could "they" pick Shakespeare in Love over Saving Private Ryan? Why do "they" like Tom Hanks so much? How come "they" always go for Woody Allen's actors? So just who are "they"? The Academy of Motion Picture Arts and Sciences is Hollywood's most exclusive club. Though Oscar viewers may deride it as a homogeneous body that makes bad calls come awards time, the academy actually is a big, broad assemblage of people with wildly different backgrounds and fiercely individualistic tastes. The 5,700 voting members are artists, actors, directors, designers, musicians, writers, studio bosses, publicists, technicians and other movie professionals. Some are rich, some are working stiffs. They may be old or they may be kids. The most common denominator: They are artistically inclined, so they never, ever think or vote with one mind. "There's so much comment that it's too old or it's not really representative of the industry," said Geoffrey Rush, an academy member who won a best-actor Oscar in 1996 for Shine and was nominated in 2001 for Quills. "But 50-some hundred people is a pretty amazing sample group. And it's not as fuddy-duddy as people like to make out." There are two ways in: Be good enough on one particular film to score an Oscar nomination, or be good enough on your overall body of work to earn an invitation. Most voting members are in the latter group. The term "gray" has been hurled at the academy — the notion that members tend to be stodgy and favor mainstream movies over edgier material. But almost every year, the Oscars defy expectations by giving trophies to underdogs. In 1999, relative unknown Hilary Swank won best actress for the gutsy Boys Don't Cry. Five years ago, Juliette Binoche won supporting actress for The English Patient over sentimental favorite Lauren Bacall for The Mirror Has Two Faces. "With the Oscars, there's always an anomaly that runs counter to all the expectations and all the handicapping that goes on," Hanks said before last year's Screen Actors Guild awards. Academy membership is a lifetime invitation, so the group does include many elderly voters. The academy also leans toward people who have been around long enough to build a track record. "On the other hand, these are not old people but people in their prime. The bulk of our members are working professionals." Nearly 80 percent of academy members live around Los Angeles, with pockets also in northern California, New York City and London. 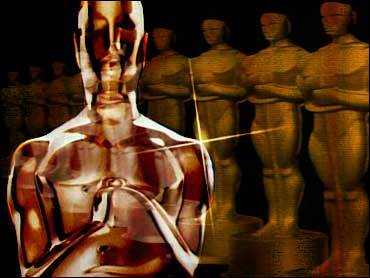 Nominees in most of the 23 Oscar categories are chosen in voting by the individual branches. For example, members of the actors branch pick nominees in the acting categories. All voting members get to cast ballots for the best-picture nominations. And for the Oscars themselves, all voting members can vote in all categories. Ideally, votes would be cast solely on the merits of a work. But there's a lot more at play. "They vote with their hearts and minds and brains and guts and groins," Rush said. "Some vote more gut than heart. Some more groin than brain, I guess." "Voters are human, and it's not unthinkable that sometimes more than the particulars of a given performance or other achievement might affect the voting in some subtle way," said Bruce Davis, the academy's executive director. Marcia Gay Harden, Best Supporting Actress winner for Pollock who was invited into the academy two years ago, said of the process: "It may be impure, granted, but the intangibles that color those waters, I think, are just part of the process. That's not a horrible thing." In the mid-1990s, the academy established strict rules prohibiting studios from sending gifts to Oscar voters, such as lavish boxed sets of videos. Studios now can send only simply packaged videos so academy members can watch potential Oscar contenders at home. The academy tolerates, but dislikes, the studio practice of bombarding industry types with ads in Hollywood trade papers. Studios might spend $2 million or more on ads, videos, private screenings and other marketing efforts for a single movie. Critics have said distributors such as Miramax, whose best-picture winners and nominees have included Shakespeare in Love, The Cider House Rules and Chocolat, manage to buy nominations or even awards through aggressive Oscar marketing. Miramax was so stung by such criticism that it deliberately spent less on trade ads last year for Chocolat, said Miramax co-founder Harvey Weinstein. "We purposely made sure we were not among the big spenders," Weinstein said. Weinstein and others say trade ads serve only as reminders of a particular film achievement or as motivation for academy members to see the movie. "Do you really think Martin Scorsese looks at the trade ads and goes, 'Oh, so-and-so must be the best picture'?" asked Davis. "These are extremely opinionated people who are going to decide the quality of the films on their own." Even in a town where big egos clash, academy members generally say they put differences and personal prejudices aside when it comes to voting for the Oscars. Douglas Wick, a Gladiator producer and an academy member for producing past nominee Working Girl, put it this way: "If I saw a brilliant performance by an actor who was rude to me at a meeting and saw a really mediocre performance from an actor who was incredibly warm to me, I'd make dinner plans with the actor who was really warm to me and vote for the great performance from the rude actor."